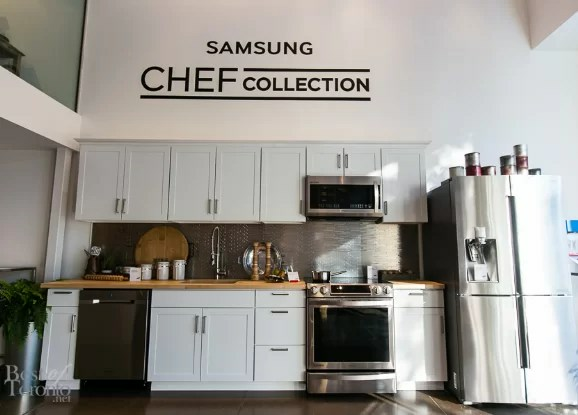 Samsung Chef Collection is the Kitchen of your Dreams. Yes you have heard that right we are talking about the famous Samsung Chef Collection digital kitchen. The kitchen you always dream of with every facility equipped inside. Well this is something you don’t want to ever leave behind even if you sell your dream home. Samsung’s latest kitchen provides you with ovens, dishwasher, cooktops and every other necessary item you need in your dream kitchen. Oh well haven’t we just skipped the Refrigerator? Well Samsung Chef Collection is equipped with the latest trending 42” built-in refrigerator that comes with 4 door flex design. Chef collection is something more than a kitchen. It is something where we spend time with our family and friends and celebrate the previous moments of our lives. Samsung Chef Collection is something that is combo of the modern technology, high performance and design. Wall ovens of the kitchen are placed along the walls while cooktops is sculpted with sleek edges and LED knobs that are well seen across the whole room. Dishwasher and the Fridge can be customized whenever there is a need to make changes in the design of kitchen. The latest appliances from Samsung are available in Matte Black Steel. In terms of the optimizations, every appliance in the Samsung Chef Collection is connected either by Bluetooth or Wi-Fi technology so that you can control them from any location you want. The 4 Door flex refrigerator is equipped with internal camera so that you can have an eye on your favourite food inside. Inside the fridge there is a zone called Flex Zone that converts from fridge to freezer when set on 4 different temperature choices. Range hoods and Cooktops come with latest virtual flame technology that gives a look and feel of a real flame. Hoods feature Bluetooth technology that makes them automatically connect to the cooktops and pro range. When it comes to bake things up, Samsung Flex Duo technology divides the single oven compartment into two separate cooking compartments giving you the freedom to cook two different dishes at different temperatures. Samsung Chef Collection is the best example of modern kitchen we were dreaming from a very long time.